Upholstery cleaning is a very specialized area of cleaning. The type of fabric your piece has will depend on the cleaning method and products that are used on it. A protector can be applied to the piece after cleaning. It creates an invisible barrier that repels soil and spills much like the “Scotch guard” that was applied when the piece was new. Our certified technicians will evaluate your furniture for cleaning. They can give an estimate before starting the job as each piece of furniture is different. Visit the IICRC website for tips on maintaining upholstery. 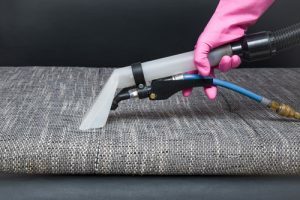 Why does my upholstery cleaning cost more than my carpet? Textile goods are more delicate and specialized. It takes twice to three times as long to clean a piece of furniture than it does a 3 bedroom home. The cleaning solutions to clean textile goods are more expensive. The cleaning solution for carpet is more “harsh” and cannot be used on textile goods. What are the different cleaning methods? Wet Clean or Dry Clean. Certain fabrics cannot get wet and therefore need to be dry cleaned. The fabric will determine which way the upholstery is cleaned. What is the price to clean my sofa? We can give you an “idea” over the phone, but a final estimate is given when the technician evaluates the piece. Price is based on the what the piece is made out of, the size and how large it is. Before calling our office flip a cushion over and see if you can find a label with information about the type of fabric. Have your upholstery cleaned by a certified professional every 1 to 2 years and vacuum on a regular basis. Call Us Today at 770-339-9340 for an appointment to take care of your upholstery cleaning.